Chan: The benefits of incorporating fish into your diet are well-known, but a lot of women don’t eat enough fish. 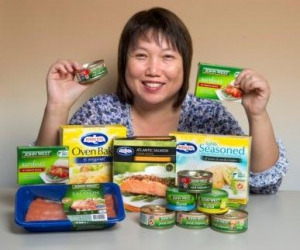 Women are often told to eat more red meat, yet Flinders University PhD candidate Lily Chan (pictured) says it is just as important for women to increase their weekly fish intake. In Ms Chan’s recent eight-week study of 39 women aged 18-50, those who ate about 450g of fish per week had significantly higher levels of long chain omega-3 fatty acids in their blood compared to those who had fish once a week or less. Mainly found in marine sources, long chain omega-3s are a type of fatty acid which has been shown to reduce heart disease, inflammation and assist in foetal development. The National Heart Foundation and Food Standards Australia New Zealand recommend two to three 150g servings of fish per week, however Ms Chan said studies suggested less than half of Australian women would consume fish twice a week or more. "The benefits of incorporating fish into your diet are well-known, but a lot of women don’t eat enough fish, especially oily fish," Ms Chan, based in the Department of Nutrition and Dietetics, said. "They might be worried about having higher levels of mercury in their blood but our results showed that while mercury levels did increase, it wasn’t to an unsafe level." Participants also stated that it was relatively easy to incorporate more servings of seafood into their diet, including tinned fish, fresh fish and frozen convenience meals. "Unlike other studies, our participants were provided a variety of different fish to eat so they had options, and they all said it wasn’t difficult to increase their dietary intake." Ms Chan said while the results confirmed the benefits of a high fish diet, consumers should still select their foods carefully. "Oily types of fish such as Atlantic salmon and sardines usually provide more omega-3s than white fish and it’s also a good idea to limit intake of predatory fish with higher mercury levels, such as shark (flake), swordfish, marlin, orange roughy and catfish," Ms Chan said. Ms Chan’s principal supervisor is Professor Lynne Cobiac and the research has been funded by the Australian Seafood Cooperative Research Centre.